HomeAll articlesVision & IdentificationA Hazy Problem? Sensor Instruments GmbH: At first everything seemed to be quite clear, just another measurement task that we surely would manage without any problems with one of our GLOSS series sensors. According to the descriptions provided by the customer it seemed to be gloss grade measuring task, and at the beginning the only question seemed to be at which angle measurement should be performed: 20°, 60° or 85° from the vertical? But when we compared the measurement results of our gloss measurement with the results of the previously prevailing method of visual inspection – determining the quality of stainless steel sheets after processing in the calender by way of inspecting the mirror image – we were surprised to see that the results of these two methods did not match at all. So where was the error in our reasoning? Why did the approach of measuring direct reflection not yield proper results? From the descriptions of our customer we knew that the clarity of the mirror images is used as a measure for the quality of stainless steel sheets. This gave us the idea to design a sensor that integrates the stainless steel surface quasi as an optical element in the beam path. The stainless steel sheets thus served as a mirror component, and a diffuse white-light source with line grid was used as object. From the stainless steel surface that acted as a mirror, this line grid then was mapped on a line detector. A higher clarity of the stainless steel surface thus resulted in a higher amplitude of the video signal arriving at the line detector, and a higher rate of streaking in the object (mirror) resulted in a lower amplitude of the video signal. The measured amplitude and the so-called video signal length matched the traditionally used manual approach surprisingly well. The customer thus now has a measurement system that is able to determine the streaking or haze factor inline. 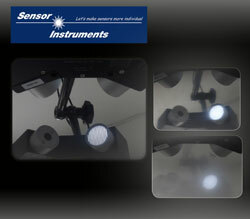 The GLAST-85-30°-DIF-1.0/1.0 sensor operates at a distance of 85mm from the measuring object. The detection length at this distance is 20mm with normal resolution, and 10mm with high resolution.